Ferric Ammonium Citrate I.P. ............................. 160 mg.
Vitamin B12 I.P. ................................................. 7.5 mcg. Folic Acid I.P ...................................................... 0.5 mg.
Zinc Sulphate Monohydrate U.S.P...................... 20.61 mg. Adequate overages of Vitamins added to compensate for the loss on storage. For the prevention and treatment of nutritional deficiency anaemia related to Iron, Vitamin B12 and folic acid. - For the prevention and treatment of anaemia in pregnancy and lactation. 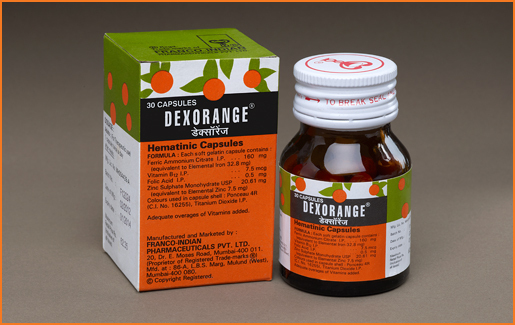 - For the treatment of Iron deficiency anemia due to chronic blood loss, hook-worm infestations etc.